FDA approved subgingival delivery devices containing antimicrobial medication(s) are inserted into periodontal pockets to suppress the pathogenic microbiota. These devices slowly release the pharmacological agents so they can remain at the intended site of action in a therapeutic concentration for a sufficient length of time. Do not report D4381 to describe the use of Perio Protect.® D4381 reports the localized delivery of antimicrobial agents into the periodontal pocket. The Perio Protect® method utilizes custom trays to facilitate the delivery of antimicrobials to the entire upper and lower arches. Use D5994 to report Perio Protect®, per tray. Do not use D4381 to report chlorhexidine or other irrigation. See D4921 to report gingival irrigation - per quadrant. Sustained or controlled releases LDAAs (local delivery antimicrobial agents) are placed in deep periodontal pockets in an attempt to reduce the bacterial load in the pocket area. Reducing the bacteria will reduce the inflammation. LDAAs come in the form of powders, gels, or thin wafer-like chips (e.g., Atridox, Arestin, PerioChip, etc.). The American Academy of Periodontology's position on LDAAs is contained in their “Statement on Local Delivery of Sustained or Controlled Release Antimicrobials as Adjunctive Therapy in the Treatment of Periodontics" (May 2006): “Clinicians may consider the use of LDAAs in chronic periodontitis patients as an adjunct to SRP when localized recurrent and/or residual pocket depth greater than or equal to 5mm with inflammation is still present following conventional therapies.” The conventional therapies referred to in this quote are scaling and root planing (D4341/D4342). D4381 is reported on a per tooth basis. The fee for each tooth should vary by the number of sites treated. A flat rate (per site) or sliding scale may be used to set the fee. For example, a fee for a tooth with two sites might be $55, or with three sites might be $75 or higher. The narrative should document that the fee is based on number of sites treated and amount of material used. Many payers limit the total UCR fee to one-half of a quadrant SRP reimbursement. Sometimes there is a reimbursement limitation to two or three teeth per quadrant. Chemotherapeutic agents may be used as appropriate to reduce the quantity of microbial pathogens, or to alter the host response through local delivery. D4381 specifies a controlled release vehicle for the delivery of antimicrobial agents. 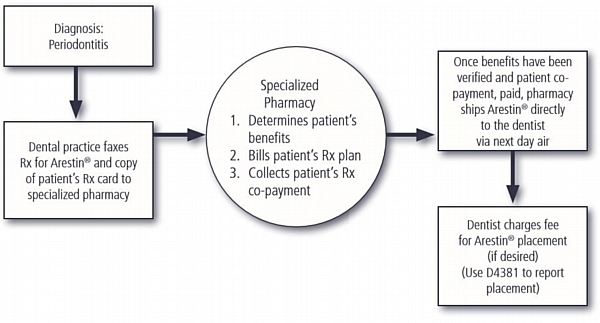 Some plans do not provide benefits for local delivery of antimicrobial agents. Generally, to qualify for reimbursement, patients must have moderate to severe periodontal disease and a history of scaling and root planing (SRP) or current treatment of active periodontal disease. Comparative periodontal charting can be helpful in demonstrating conventional therapy (SRP) has not been effective. Be aware that while a few dental plans pay for D4381 when placed at the time of root planing and scaling (SRP), most limit reimbursement for D4381 to areas that continue to bleed on probing at least six weeks following SRP therapy. In some cases, D4381 may be considered a “take back” code by some payers. If osseous surgery (D4260/D4261) is initiated within twelve months of reporting D4341, the fee reimbursed for osseous surgery may be reduced by the amount previously reimbursed for D4381. Reimbursement for D4381 is highly variable among payers. D4381 reimbursement for the same site may be denied for up to twenty-four months following the initial treatment. Some payers reimburse D4381 on an annual basis. Reimbursement for D4381 is highly variable. When submitting D4381 with a predetermination, indicate the time interval anticipated between the SRP visit and proposed D4381 treatment date. A six-week minimum after SRP may be required. The insured's medical pharmacy benefit may pay for the antimicrobial agent. Contact an Arestin® representative for further information regarding medical insurance billing. Report D4381 for placement of FDA approved localized antimicrobial agents such as Arestin®, PerioChip®, and Atridox®. The descriptor of D4381 requires that the agent must be "FDA approved" - so homebrew (non FDA approved) cannot be reported. D4381 is an adjunct to D4341, D4342, or D4910. D4381 is also an adjunct to the prophylaxis (D1110) when used to treat a few isolated pockets. Note: D4381 may not be reimbursed if placed at the initial scaling and root planing (D4341/D4342) appointment. The patient is usually required to pay out of pocket for the first application, if placed at the initial scaling and root planing (D4341/D4342) appointment. D4381 is most often reimbursed when utilized at the four to six week evaluation appointment after SRP. D4381 may be reimbursed if placed at a subsequent ongoing periodontal maintenance (D4910) visit when provided in conjunction with site specific scaling and root planing procedures performed to treat unresponsible pockets. Some payers require that the patient be six weeks post SRP before reimbursing D4381. It is recommended that coverage and limitations be verified with the payer before providing D4381. The narrative should document that initial scaling and root planing (SRP) adid not resolve all the pockets. Also mention the actual medication, not the trade name (Minocycline HCL, instead of Arestin®.) Documentation such as SRP history, charting at all visits, diagnosis, loss of attachment, radiographic evidence of bone loss, bleeding on probing, dates of re-evaluation, etc., with ongoing periodontal charting is typically required. Also, document the desired outcome of the procedure, as well as including any contributing medical factors such as diabetes, heart disease, surgical candidate for hip replacement, etc. If D4381 is used in an attempt to avoid osseous surgery, also indicate this intent in the narrative. A narrative should always be submitted when reporting D4381 in association with a periodontal abscess, for possible reimbursement. See the table below for documenting D4381 on the ADA Dental Claim Form. Reimbursement for D4381 often requires unresponsive 5mm to 7mm pockets at least six weeks after SRP, loss of attachment or bone loss, bleeding on probing (BOP). This is indicative of active periodontal disease. These unresponsive areas should be limited to two to three specific teeth treated per quadrant. In addition, any increasing pocket depth readings after scaling and root planing (SRP) should be noted. “See attached pre-operative and post-operative periodontal charting.” Be sure to document any systemic medical issues, such as diabetes, heart disease, etc. If the Arestin® is furnished by the patient's medical pharmacy benefits, the dentist may charge a placement fee, reporting D4381. The placement (labor) fee would be less and typically limited to two teeth per quadrant. Full documentation would need to be provided as outlined in the narrative above.